Bake cupcakes. Cover with White Frosting. Cover in white, yellow and cream Jelly Belly's. Add a yellow star burst that you stretched out for the butter. Sprinkle black and white sugar on top for the salt and pepper. Stick some corn holders in the sides of the cupcakes. 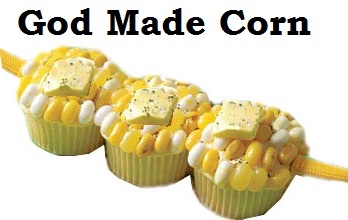 Make these cute corn on the cob cupcakes and take them to children's church for the kids. Use this Corn Sunday School Lesson to go with it.